A retelling of Northanger Abbey through the perspective of Henry Tilney and his sister, Eleanor, this story begins with the younger years of the Tilney siblings. Frederic, at eighteen, has recently been disappointed by a young lady and as a result has sworn off women—at least in the proper sense. He still wishes to cause mischief and anguishes his strict father so much that he insists on the army finishing Frederic’s education. Henry, at sixteen, is the calmer and more perceptive son, and will become a parson at Woodson upon his majority. Three year’s Henry’s junior, Eleanor must dodge undesirable suitors her father throws in her path in the attempt to gain her a title and/or add to her fortune. Eleanor and Henry had always been close and shared a love of Gothic novels, and with Henry always teasing about eerie situations, Eleanor decides his future love must also share of a love of novels. There are many excerpts from their reading inserted into the story that are entertaining in themselves (which caused me to look at my Victoria Holt novels longingly). A few years pass before he actually meets Miss Morland in Bath, though a situation concerning another possible suitor and her brother’s betrothed complicate things. Henry’s father will only countenance matches that meet or exceed his own family’s status and means. Therefore, when Eleanor falls in love with a poor relation of a viscount, she is forbidden to pursue her heart’s desire. Henry, though in a similar situation, finds his father is unexpectedly courteous and welcoming of Catherine Morland, as friend to Eleanor and possible wife for Henry. However, true to the Gothic theme presented in the first of the book, strange occurrences take place and the siblings find difficulties along the way. Having never read Northanger Abbey by Jane Austen (or seen a film representation) this story was entirely new to me and I didn’t find this Catherine Morland incredibly inspiring. 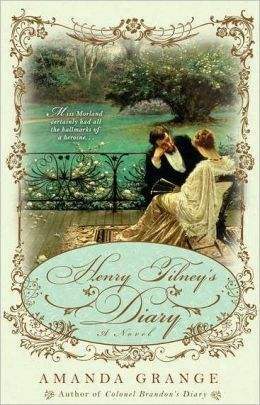 Henry, however, is very charming, as is Eleanor and other characters are fleshed out to display their personalities so that a reader such as myself can get a feel for the original. This Austen retelling has reminded me that Northanger Abbey needs to be on my to-read stack in 2012, and perhaps I will understand more of Catherine Morland’s character and what exactly attracted Henry Tilney to her upon their meeting in Bath.